This meeting was held at 6:00pm at the Taverna Greka Restaurant, New Westminster. Guest speaker was G.C. (Scottie) Scott. This meeting was held at 4:15 pm at the Law Courts Inn in Vancouver, British Columbia. The Guest Speakers were Michelle Isaak,Debra Thomas, and Gordon Behan. Materials from the Intellectual Property and Technology Law Section Meeting. Materials from the Legal Research Section Meeting. 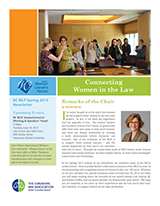 This spring edition of the WLF newsletter includes an interview with Aimée Craft, Chair of the CBA National Aboriginal Law Section, and an update on the Justicia Project. Materials from the Wills and Trusts-Vancouver Section Meeting.